So, a “time machine” may never exist, but that’s not stopping a non-profit Alzheimer’s care center from bringing the past into the future with its latest foray into Alzheimer’s disease treatment. “Time Travel” to Treat Memory Loss? It’s estimated that 5.4 million people in America suffer from Alzheimer’s disease, with this number expected to climb as the Baby Boomer generation continues to age. And so far, treatment has been relatively limited. But one particularly interesting area of study—which appears to have had positive results—is exposing patients to the experiences of their youth. There is evidence of almost catatonic individuals, for example, becoming lively and conversational upon hearing their favorite music of yesteryear. Now the George G. Glenner Alzheimer’s Family Care Centers in San Diego is building what essentially looks like an American town circa 1953-1961, a time when most Boomers were in their teens, 20s, or 30s. Constructed in a warehouse, the community will feature a town hall, pet store (with live animals), museum, library, diner, hospital, movie theater, and parkade, among other storefronts. It will essentially be a place where patients can walk around and take part in “reminiscence therapy.” Those “working” in the stores and other facilities will be doctors and nurses. How Does Reminiscence Therapy Work? Reminiscence therapy is a method that helps people recall happy memories from their past. Research shows it helps improve cognition and quality of life. This project in San Diego looks to immerse Alzheimer’s disease patients in this state of bliss, hopefully allowing them to become more engaged, functional, and happy in their daily lives. Of course, you may not be in San Diego or able to get your loved one with Alzheimer’s disease into the program. But that doesn’t mean there aren’t steps you can take in your attempts to revive memories and traits that the disease has taken from your loved one, whether it’s Alzheimer’s or some other form of dementia. 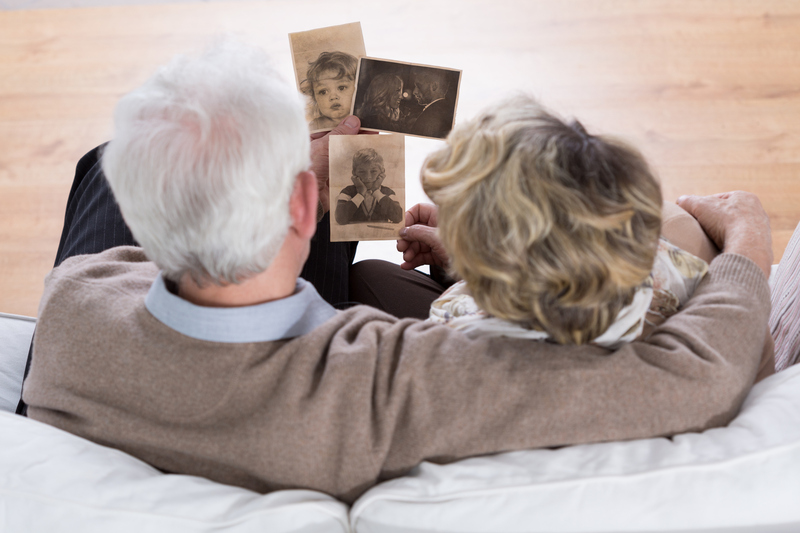 Some ways you can utilize reminiscence therapy is by looking at pictures from the past. And I don’t necessarily mean family pictures—perhaps pictures of automobiles, clothing, or celebrities will stimulate the brain and get your loved one excited. If the pictures feature something they are particularly interested in, even better. Playing their favorite music from when they were in their teens, 20s, and 30s can help too. In doing this, however, you’ll have to be very patient. Remember that ultimately, the goal is to stimulate and create happiness in your loved one to improve their quality of life, provide a topic for conversation, and get their brain firing. Hurley, A., “Time-Travel Therapy,” The Atlantic, January/February 2017, pp. 28-29. Woods, B., “Reminiscence therapy for dementia,” Cochrane Database Syst Rev. 2005 Apr 18;(2):CD001120. “The Benefits of Reminiscence Therapy for Seniors,” Assisted Living Today, January 9, 2017; http://assistedlivingtoday.com/2012/12/the-benefits-of-reminiscence-therapy-for-seniors/, last accessed March 23, 2017. “Man Reacts To Music: How Music And The Elderly Work Together (VIDEO),” The Huffington Post, April 17, 2012; http://www.huffingtonpost.ca/2012/04/11/man-reacts-to-music_n_1417115.html, last accessed March 23, 2017.